Dr Shoba Sivasankar was formerly the Director of both the CGIAR Research Program on Grain Legumes and the Research Program on Dryland Cereals. She was based at the International Crops Research Institute for the Semi-Arid Tropics (ICRISAT) in India. Dr David Bergvinson is Director-General of ICRISAT. Dr Pooran Gaur is Assistant Director of the Grain Legumes Research Program and Principal Scientist for chickpea breeding at ICRISAT. Dr Shiv Kumar Agrawal is Food Legumes Coordinator within the Biodiversity and Integrated Gene Management Program at the International Centre for Agricultural Research in the Dry Areas (ICARDA) based in Morocco. Dr Steve Beebe is Leader of the Bean Program at the International Center for Tropical Agriculture (CIAT) in Colombia. Dr Manuele Tamò is an insect ecologist at the International Institute of Tropical Agriculture (IITA) in Benin, with a particular focus on IPM in cereal-legume systems. He has worked with organisation such as AVRDC, ICRISAT and AfriceRice on IPM projects in many countries. Grain legumes are characterised by their nutritional value, an ability to grow rapidly and improve soil health. This makes them a key rotation crop in promoting food security. However, yields are constrained by factors such as pests and diseases as well as vulnerability to poor soils, drought and other effects of climate change. This collection reviews the wealth of research addressing these challenges. 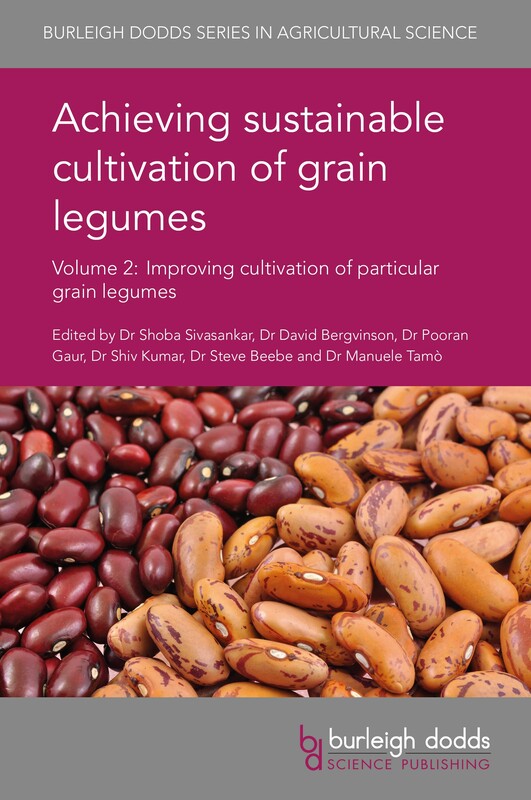 Volume 2 assesses key research on particular types of grain legume with chapters on developing improved varieties as well as improvements in cultivation techniques. The book covers common beans, lentils, soybeans, groundnuts, cowpea, faba beans and pigeonpea. With its distinguished editorial team and international range of expert authors, this will be a standard reference for the grain legume research community and farmers of these important crops. It is accompanied by a companion volume which reviews general advances in breeding and cultivation techniques.